Intel’s next major CPU microarchitecture being designed for the 10 nm silicon fabrication process, codenamed “Ice Lake,” could introduce the first major core redesign in over three years. 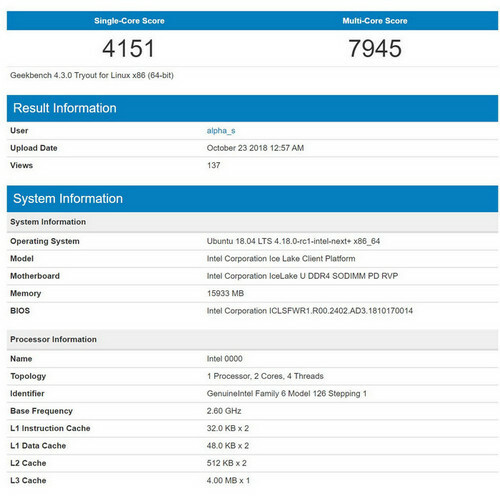 Keen observers of Geekbench database submissions of dual-core “Ice Lake” processor engineering samples noticed something curious – Intel has increased its L1 and L2 cache sizes from previous generations. The L1 data cache has been enlarged to 48 KB from 32 KB of current-generation “Coffee Lake,” and more interestingly, the L2 cache has been doubled in size to 512 KB, from 256 KB. The L1 instruction cache is still 32 KB in size, while the shared L3 cache for this dual-core chip is 4 MB. The “Ice Lake” chip in question is still a “mainstream” rendition of the microarchitecture, and not an enterprise version, which has had a “re-balanced” cache hierarchy since “Skylake-X,” which combined large 1 MB L2 caches with relatively smaller shared L3 caches.